THE DEPARTMENT OF Foreign Affairs says that the situation involving the four Irish citizens being detained by authorities in Egypt remains unchanged since Wednesday. 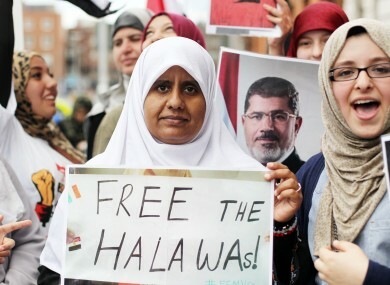 Omaima (21), Fatima (23), Soumaya (27), and their 17-year-old brother Ibrahim Halawa have been held in Cairo’s Tora prison since being taken from the al-Fatah mosque last Saturday. They had been visiting the country and were involved in a protest against the recent ousting of elected president Mohamed Morsi when they sought refuge in the mosque after violence broke out. It is understood they continue to be detained but there have been no further developments despite in their case despite reports on Wednesday that they face a number of serious charges including attempted murder, possession of firearms and being members of a militant group. Tánaiste Eamon Gilmore said on Wednesday that he was concerned about the reports emanating from Egypt and said the government was watching the “situation very closely”. A consular official from Ireland’s embassy in Cairo visited the four siblings in prison on Tuesday and reported to the Department of Foreign Affairs that they were “in good spirits”. Email “No update on status of Halawa siblings being held in Egypt ”. Feedback on “No update on status of Halawa siblings being held in Egypt ”.